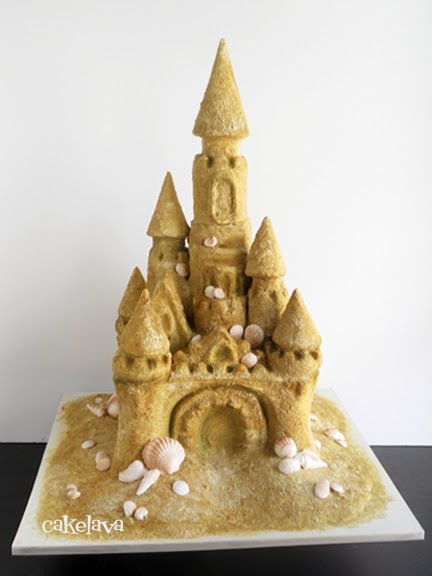 In our roundup of non-traditional wedding cakes which included a sculpted Jeep, an Okinawan castle, and a gold Buddha, we fondly remembered LéMonaco and Delfino's sculpted Fairy Tale Sandcastle. Sculpted non-traditional wedding cakes have been on our minds a lot lately as we start our planning for two more in the coming weeks that we are very excited about! We won't spoil the surprise of the cake themes - you'll just have to come back to find out! We continue our "Non-Traditional Wedding Cakes" series with one of our all-time favorite (and most difficult) sculpted cakes, a giant gold Buddha made for Romina and Arian, a couple from Texas who flew to Oahu to celebrate their vow renewal. If you've been following our blog or facebook for a while, you may recognize their cake from a previous post. 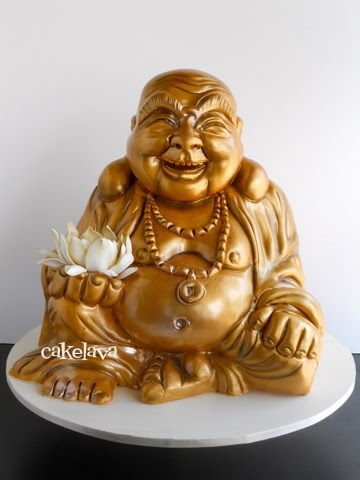 In case you missed it, you can read the backstory on "Gold Buddha Cake for a Vow Renewal". We definitely felt the pressure when making this cake. 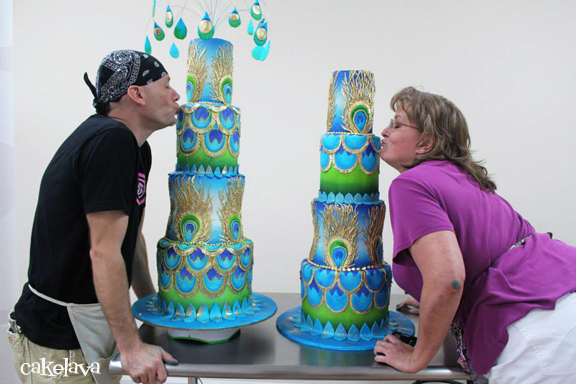 Aside from Rick sculpting out of cake a truly iconic and religious figure with great significance throughout the world, Arian and Romina are a high-profile couple in the media and we knew their cake would be under serious scrutiny! We really enjoyed working with the couple and arrangements had been made in advance for us to meet them when the cake was delivered. This granted us one of the biggest pleasures of any cake designer - to witness the expression of your clients when they first see their cake. Romina and Arian were ecstatic when they saw their sculpted gold Buddha holding a white lotus flower! Although the timing prevented us from being able to see either Heather and Joe or Sayo and Torrell on their wedding day, both couples reached out to us shortly afterwards to say how thrilled they were with their cake! 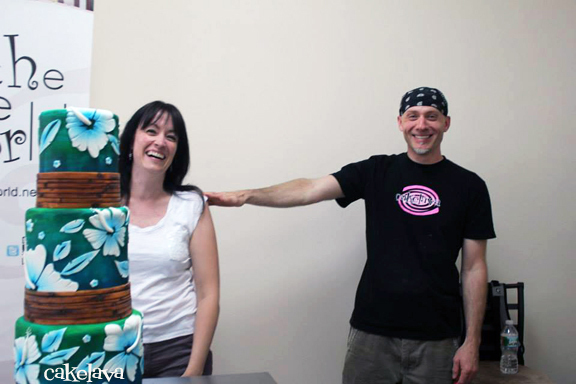 Next week, we're featuring another non-traditional wedding cake, made for a couple wanting to live Happily Ever After! 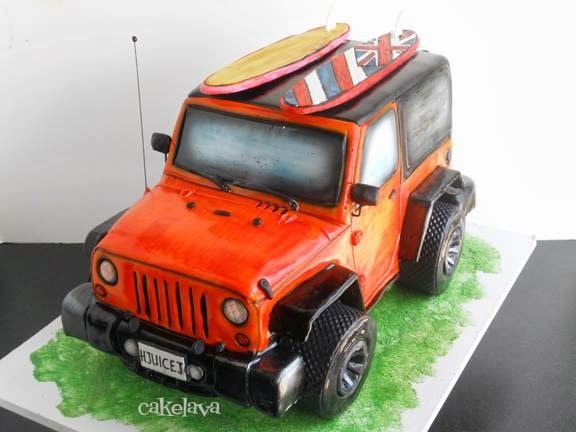 Like Heather and Joe's sculpted Jeep wedding cake, Rick and I were excited about Sayo and Torrell's non-traditonal wedding cake idea from the time we got the order. 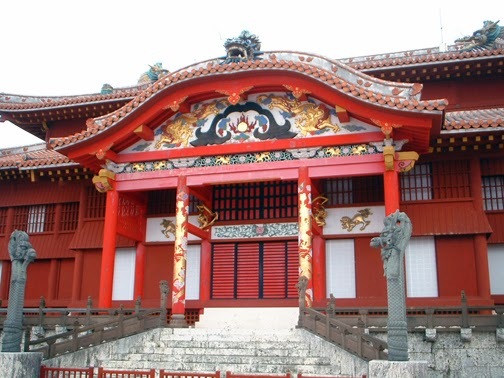 The bride Sayo is from Okinawa, Japan, and the couple have history there together, so they wanted to honor her culture and their special place with a design inspired by the exquisite Shuri Castle (shown below). We learned from the couple that the male and female Shisa lion-dogs guarding the castle were important to them and they asked Rick to include them in his design. There are photos of Shisas on the internet and their appearance varies greatly. Some are more serious and others take a lighter, more humorous approach, which was the couple's preference for their cake. We were given a small figurine for reference but Sayo and Torrell left the actual faces up to Rick - as long as they were fun and represented a male and female Shisa. Since the cake was for a wedding, Rick decided to make the cake stacked and symbolic of, rather than a precise architectural representation of Shuri castle. 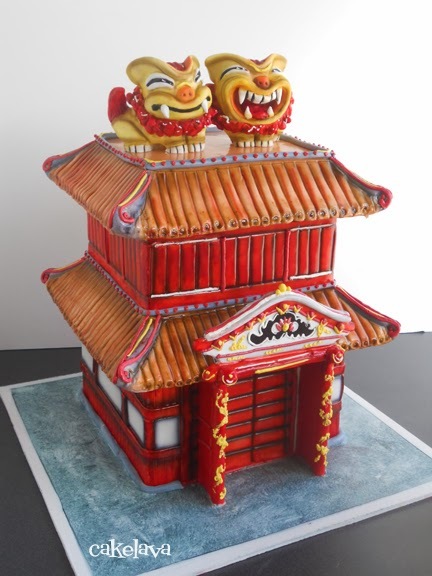 The two Shisa figures were placed on top of the roof, and became custom cake toppers. Traditionally, the Shisa's are either placed on people's rooftops or in front of their gates, to protect from evil spirits. The left Shisa has a closed mouth and the right Shisa has their mouth open. The female (bride) Shisa has a closed mouth, to keep good spirits in, and the male (groom) Shisa has an open mouth, to ward off evil spirits. 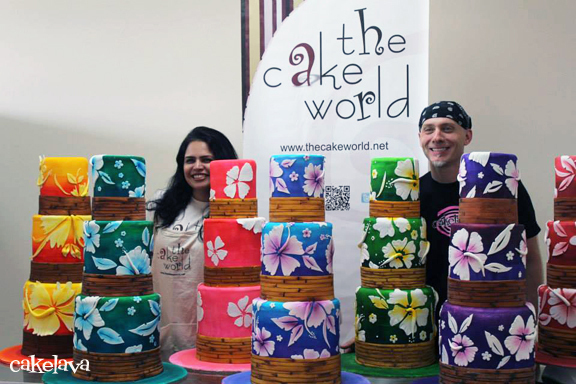 Their wedding cake brought together Sayo and Torrell's experiences in both Okinawa and Hawaii. They chose tropical flavors - coconut and mango to serve their guests. This non-traditional wedding cake inspired us creatively and also taught us a lot about the Okinawan culture. In our next post, we have another non-traditional wedding cake to share. It is a striking sculpted figure that will be instantly recognizable, made for an NFL player and his wife for their vow renewal! 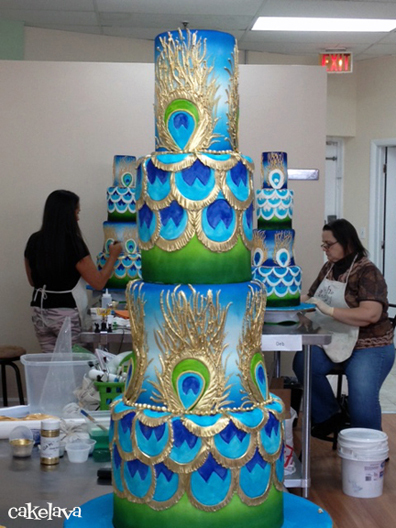 I've noticed we're getting more requests for non-traditional wedding cakes, specifically, sculpted themed cakes showcasing a couple's interest or culture. Wedding couples are constantly seeking out new ways to personalize their wedding and make the experience unique and memorable for their guests. Having a sculpted showpiece cake with a huge "WOW" factor and an instantly recognizable theme is one of many ways couples are making an impact with their guests. We love the anything-goes attitude we're seeing with wedding cakes, and we encourage our couples to get as creative as possible. Luckily, Rick is up to the task and ready to take on nearly any challenge! We already have some very interesting non-traditional wedding cakes planned for next year, and are excited to make them! Here is one of our recent favorites, with more to follow on the blog this week! Rick made a sculpted replica of the couple's orange jeep. 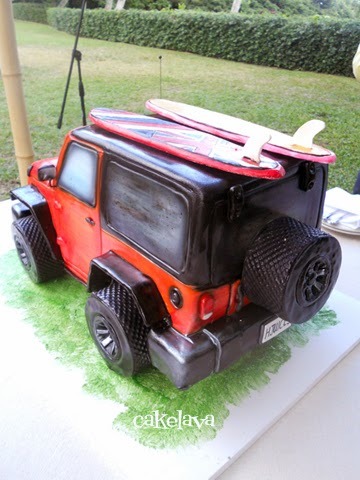 The jeep and its tires are all sculpted out of cake. On top of the cake, were the couple's custom paddleboards, one with a design of the Hawaiian flag and the other with a bamboo pattern and pink edging. 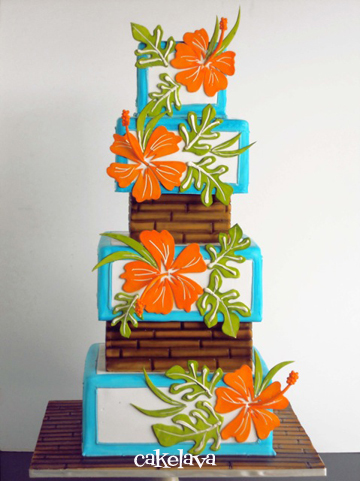 The couple loves the beach and goes stand up paddleboarding - this cake was perfect for them! 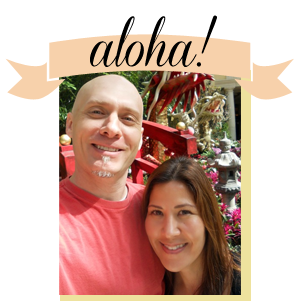 Their coconut and guava flavored cake was delivered to the picturesque Moli'i Gardens at Kualoa Ranch. On our next post we have another non-traditional wedding cake to share. The gorgeous wedding cake took Rick many hours to make and honors the bride's culture and where the couple met. 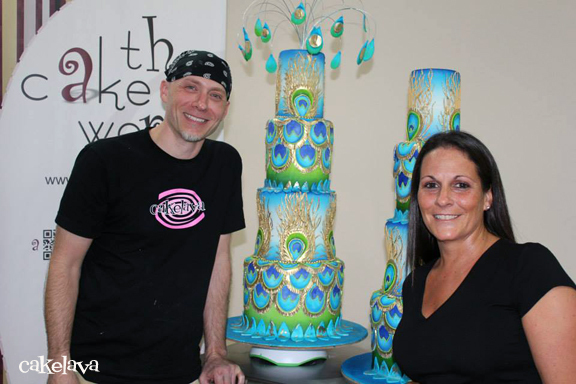 As a cake designer, Rick's specialty is custom art cakes. 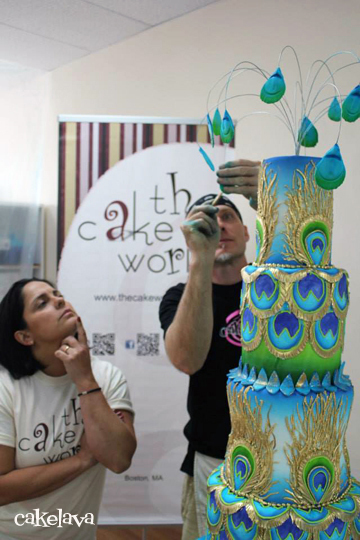 He has a background in fine art and pastry and loves sculpting, hand painting and airbrushing on cakes. For Alex's 40th birthday, Rick employed some of his favorite art techniques to make an unforgettable, truly personalized cake for a man we greatly admire and who, along with his lovely wife Yvonne, is one of Hawaii's top wedding vendors. Alex and Yvonne own two companies, Yvonne Design and Mood Event and they have been wowing us and our clients with their amazing talent for years! Just look at their websites and you'll see what we mean! Alex is a man of many interests and one he is most passionate about is competitive running, which is the area we focused on for his cake. 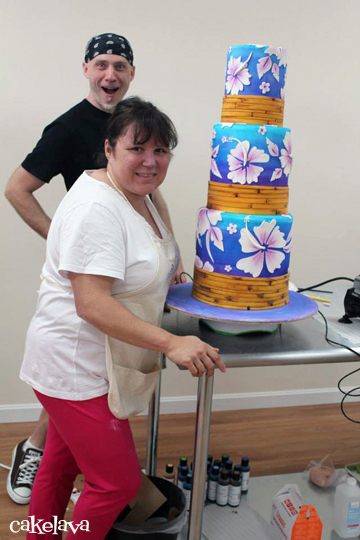 When Yvonne ordered the cake for Alex's surprise birthday party, we knew the cake needed to be fantastic! It was for Alex G, afterall! 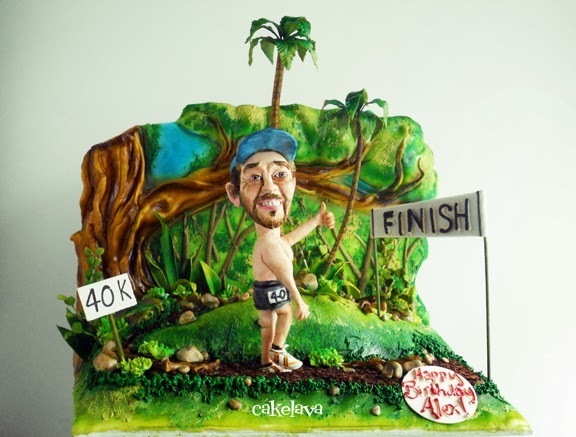 The cake would be sculpted with a running theme, and a custom figurine of Alex on a woodsy trail about to cross the finish line of his 40 K. The idea of 40 K trail worked great since it was close to the length of an actual marathon and also represented Alex's big birthday! Rick studied many photos of Alex when he was making the figure and spent quite some time getting everything just right. We both felt the pressure of creating a likeness of someone everyone in the wedding industry knows and who we greatly respect! The cake was a huge success! We received compliments from Yvonne and Alex and their guests. We attended the party as guests, and were very impressed at how beautiful everything looked! The party was brilliantly designed by Yvonne and the Mood design team - even Alex unknowingly contributed to making his own decor. The party was filled with Alex's favorite things and different aspects of his life that would be honored in some way. Guests dined on Alex's favorite foods and for dessert, the awesome cake in his favorite flavor, Peanut butter and chocolate, an unbeatable combination that makes my mouth water just thinking of it! Happy Birthday, Alex G. It was an honor to immortalize you in cake! For many brides, one of the most important components of their wedding is the flowers. Brides love flowers - big, beautiful flowers, and the more the better! We have seen this obsession for flowers carry over to the cake design requests, and Rick is now needing to set aside even more time in his schedule each week to make flowers. 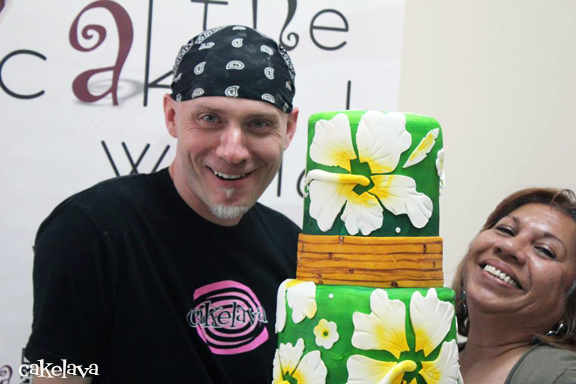 During a recent week, he spent no less than 25 hours making flowers for just a few cakes. Rick started at least a week before the events just to have everything finished in time. After seeing the breathtaking results, the effort is so well worth it, and our clients think so too! Some weeks our kitchen looks like a color explosion and the cakes are fun, bold, and full of energy, but that week, all I saw was row after row of flowers. It was a beautiful sight and I can't say I minded one bit! One of the most labor intensive handcrafted floral designs we make is the cascade style, in which flowers are placed cascading down the tiers. 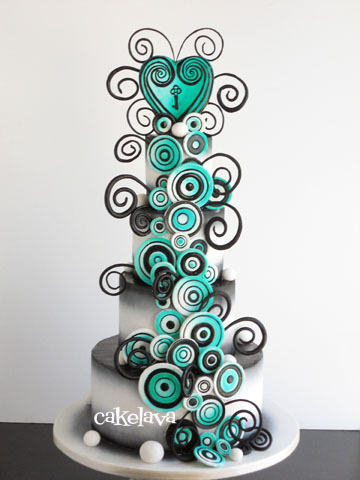 This style looks best on cakes that are three or more tiers, as it makes more impact falling over a larger area. Brides looking to have a cascade style of wedding cake with handcrafted flowers should be prepared to allocate more financially, as the labor charge can be higher than other floral cakes that use less flowers. 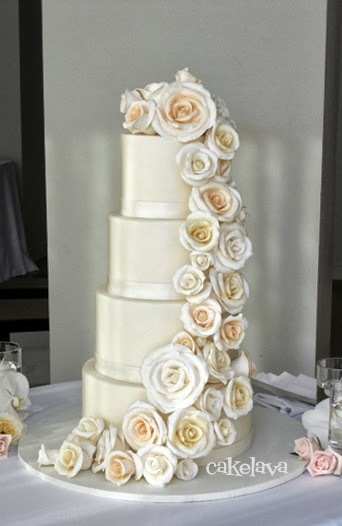 For Kiran and Perdeep's gorgeous cascade wedding cake, (above) Rick spent 8 hours making the roses of varying sizes. Every petal is handcrafted and made individually then brought together to form a rose. Imagine doing this for 8 hours! For many of us, that is an average work day. Add on the time to bake, fill and lay the fondant on the cake and paint the roses and suddenly, the cascading cake style that many brides desire and think looks "simple" is quite involved! If you are looking for an elegant, romantic cake whose main focal point is flowers, and the budget isn't a huge concern, the cascading floral is a stunning option! 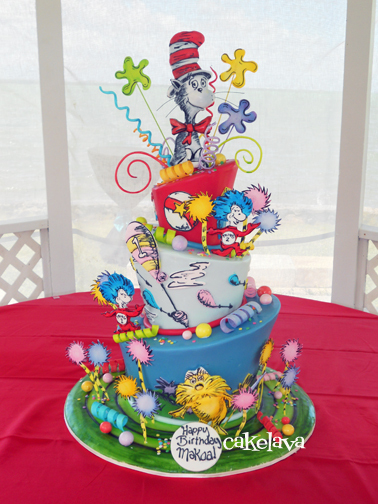 Some party themes are just too perfect for cake, and Dr. Seuss is one of them! The whimsical vision of Dr. Seuss provides a world of infinite design possibilities. We know when we receive a Dr. Seuss theme request, we're in for a really fun time, and... we also need to clear plenty of time on our calendar to work on it! It is one of our favorite themes to do and one of the more difficult due to the amount of time Rick spends making the characters and decorations. 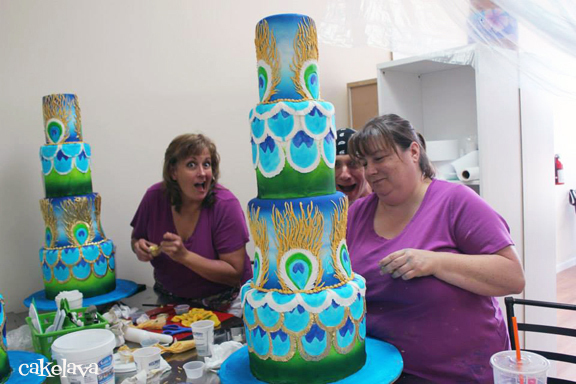 The inspiration for this colorful wonky cake was based on one of Rick's previous Dr. Seuss themed designs. The client wanted a similar look with modification to the themes to suit their party. The Lorax and truffula trees would be used in decor throughout the party and we were asked to include them. The choice of colors used was left up to Rick. Since the cake was for a boy, Rick selected blues and red for the main base colors and some of the more feminine colors were used as an accent. As I write this, I'm thinking about and looking forward to one of our cakes for next weekend. Can you guess the theme? 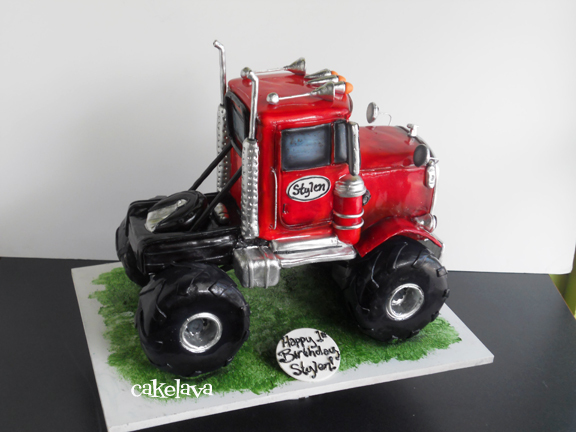 The monster truck cake is one of those requests that can make you shudder because it is so much work! Sculpting a massive truck body out of cake that has to be suspended and sit perfectly on gigantic wheels is no easy task. At the end of our first full week back in town after the Boston classes, we hit the ground running and Rick made Stylen's birthday cake. 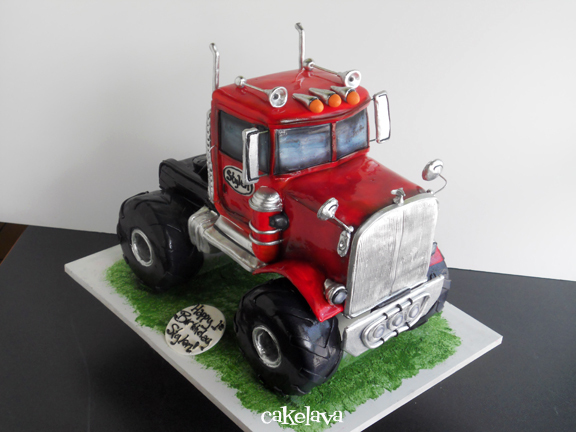 Both the truck body and its wheels were sculpted out of cake. All the detailing on the truck was handmade and painted. Applying fondant on a cake like this in the Hawaiian humidity is always a challenge, but we got lucky that week and the weather cooperated. Whew! The cake was purchased as a gift for Stylen by the child's aunt. I recall my reaction when I asked her for the child's name. She said "Stylen." I said "Did you say Stylen?". The name was about as perfect as it could be for a lucky child about to be gifted with a "stylin'" amazing monster truck cake! "Yes, Stylen." 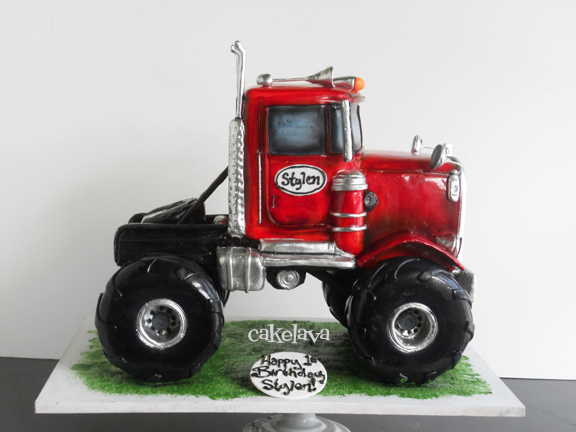 A child named Stylen and a very difficult, very detailed monster truck cake. We better not screw this up! Rick estimates he spent 15 hours working on the monster truck cake, and that is a chunk of time to devote to one cake when you have others in the same weekend. The time spent was all worth it in the end. We were so happy with the cake, and Stylen's family loved it as well! 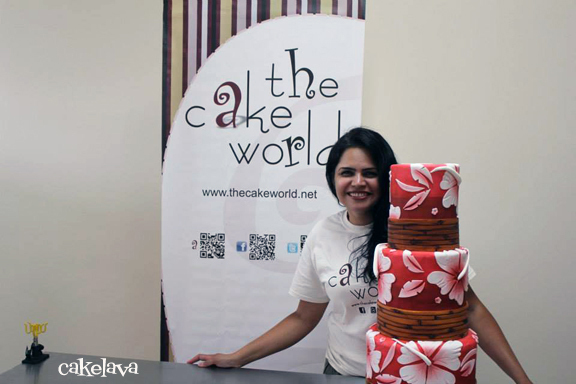 cakelava is now on Pinterest! This week we finally caved. 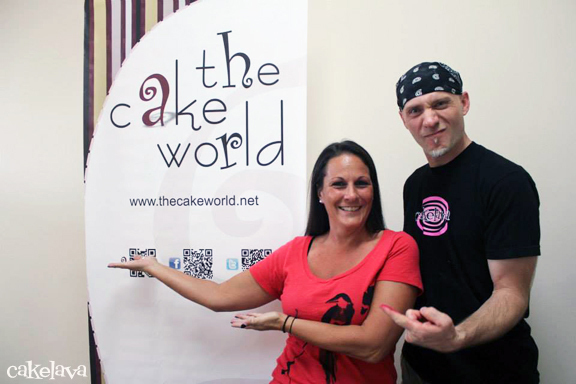 We starting pinning on cakelava's new Pinterest page, creating a small handful of boards and we were off and running! We've noticed our cakes on Pinterest for a long time, and we want to thank everyone who has pinned, commented, repinned or Liked our cakes enough to post them on their boards. 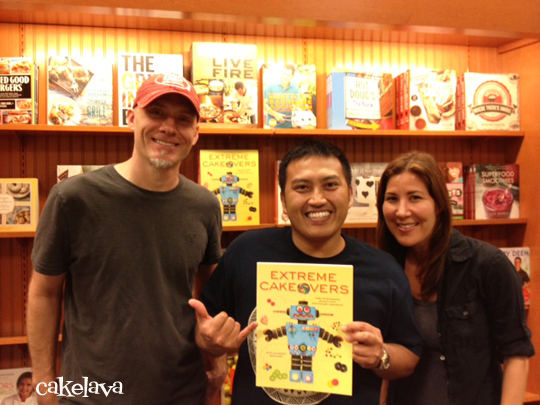 We invite you to join us on our brand new Pinterest page for cakelava and our Extreme Cakeovers book. One of our Pinterest boards is called "these are a few of our favorite cakes". So far, the "few" cakes have turned into 62 of them, and we're about to make it 63 - at least 63! 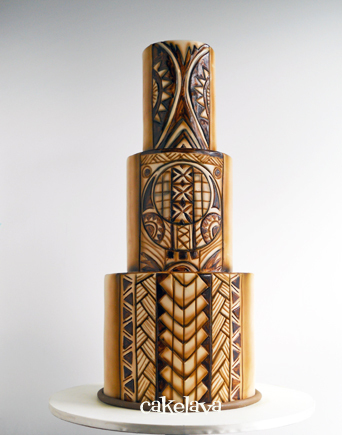 Our newest addition will be this handpainted Samoan tattoo themed wedding cake (above) which Rick made for a wedding this past January. He spent many hours painting the intricate Samoan tribal pattern by hand and we couldn't wait to present it to the couple! It is definitely one of 64 of our favorite cakes and we hope you like it too! Off to pin it! We've been busy since my last blog post. 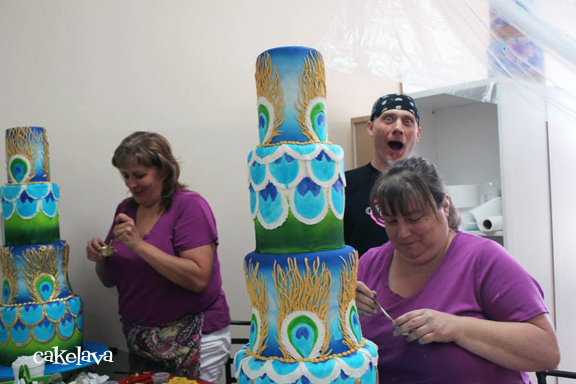 Just a few days after filming the segment for KITV News This Morning, Rick and I flew 5000 miles to Boston, to teach his Hibiscus cake and a Painted Peacock cake at The Cake World's lovely new shop in Saugus, MA. It was my first time in Boston and I wish I had more time to stay and explore all it had to offer! The trip was a bittersweet journey for us. The classes were Rick's last planned classes for 2013, a decision we made after traveling for almost half of 2012. We decided to spend most of this year at home making cakes and living a less hectic lifestyle. It was a tough decision as Rick loves teaching and entertained some amazing offers in locations we've always wanted to visit, but we stuck to our guns, and Boston was going to be the last, at least for a while. Upon arriving at Boston airport, we were greeted by our wonderful host Andreia, owner of The Cake World and her two adorable children! Her son, who must have felt an affinity with Rick, after seeing his photo over the months threw his arms around him. Now that's a welcome to Boston! This warm gesture and beaming smiles from the family set the tone for the entire class experience and we knew we were all in for a good time! Having traveled with Rick for classes on three continents, I have grown to cherish the unique experience of the classes. In every class we meet new cake friends who value the opportunity of learning in a hands-on environment. We share cake stories and spend a lot of time laughing. 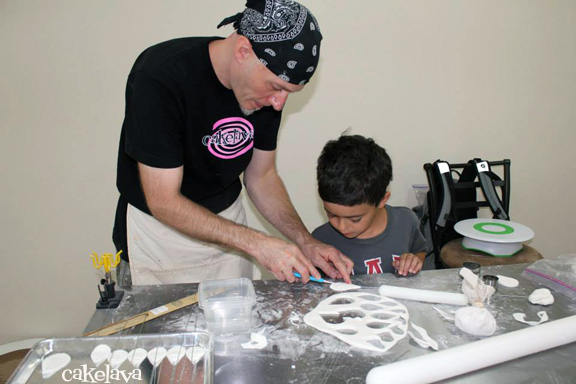 Although Rick is the teacher and there to share his knowledge, in most if not all of the classes, he has learned new tricks from his students. 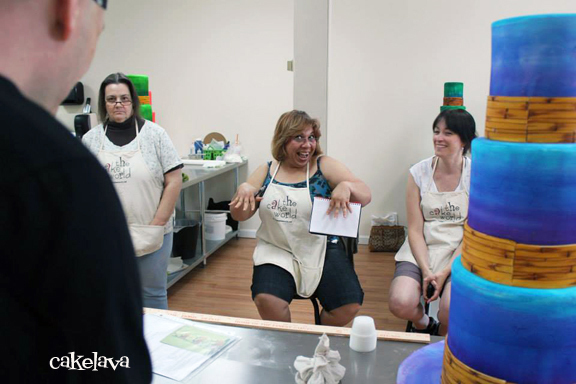 The class experience is as much about learning new skills as it is getting together with friends and having fun! There is an incredible energy in the room generated by a room full of inspired students and a teacher intent on sharing knowledge. It is unlike anything you can get from a DVD or an online tutorial. Is it pure learning "old school". You enroll in the course, show up for the class, and come prepared to be challenged and hopefully, stimulated. 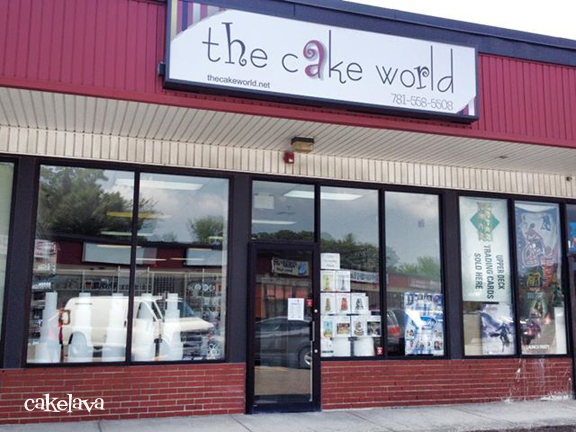 If you are lucky enough to come to a class at The Cake World, who regularly hosts cake instructors from around the world, come hungry for knowledge, bring your appetite because lunch is included, and prepare to feast your eyes on the cake supplies available for purchase at the shop! Rick's two classes were well documented by myself and The Cake World. As I was looking through the photos, the ones I was most drawn to were those that showed all the fun we all had! No one took themselves too seriously, and everyone walked away with gorgeous new cakes they were proud of! 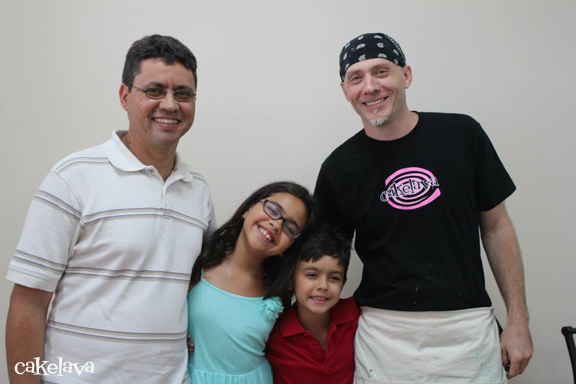 I would like to thank our fantastic host, Andreia Aguiar, and her husband and family for sharing their photos with us and making our last classes of 2013 unforgettable! 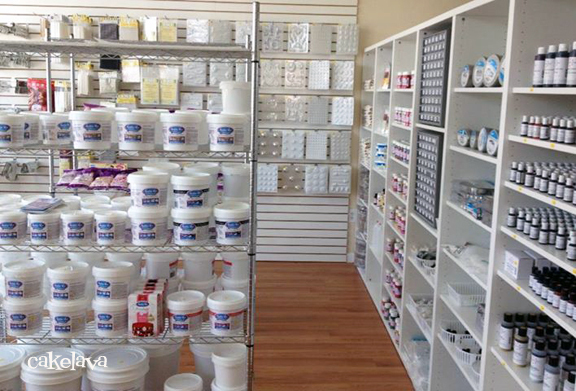 Beautifully displayed cake decorating eye candy! You won't meet a nicer family! She kept us all entertained! 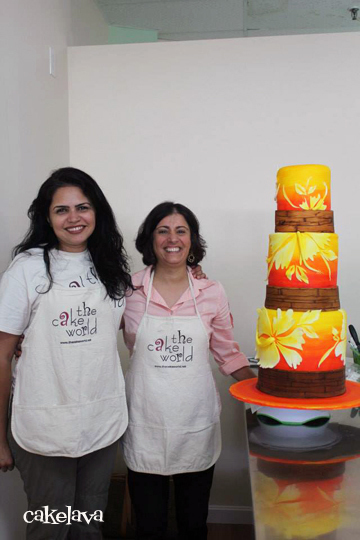 Two beautiful ladies, one gorgeous cake! She loved posing with her cake. Rick joined in on the action! The proud instructor and his host beaming after a successful Hibiscus class! 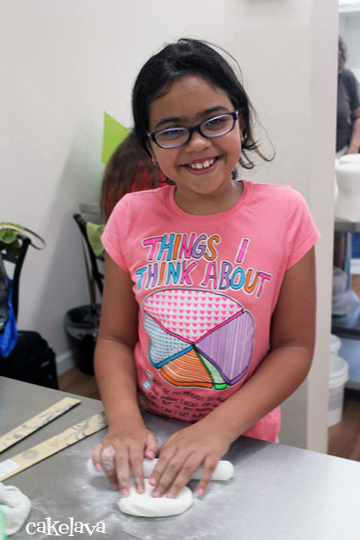 This little cutie wanted to start her cake decorating career early. She came to the right place! Rick photo bombing again. Aww, c'mon Rick, they are trying to focus! They couldn't resist getting in on the action! Wow! Look at all these beautiful cakes! An absolutely heartwarming shot of Rick teaching Nicolas, the owner's son how to make the peacock feathers. 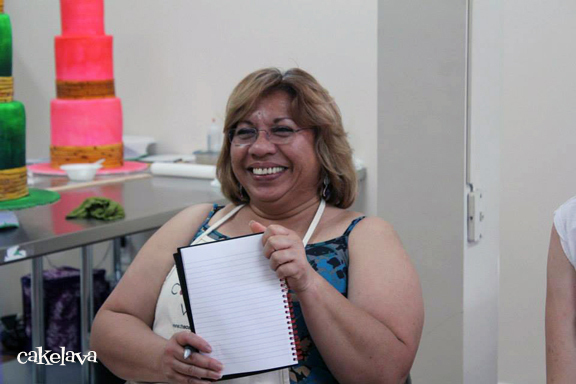 She joined us for both classes and her cakes were exquisite! 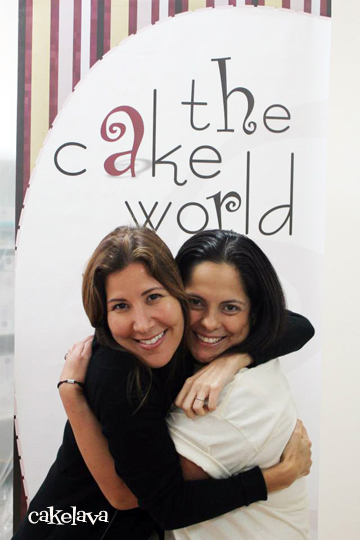 Thank you to The Cake World for an awesome week and so many memories! Sometime during the course of the past two years, on more than one occasion, we have wondered what it would feel like to see a stranger pick up our book to look at it. Would we feel proud? Would it make us blush? Would it happen in a store or somewhere else, and would we claim ownership of the book to the stranger who was looking at it? In our minds, I think we imagined it as an isolated incident, a surreal experience, that would just happen. I didn't think about what would happen before or after, or what the context would be, just that it was something we both desired to experience. Friday, July 12th is a day we will remember for a long time. It started bright and early, before the crack of dawn, when we woke up to get ready for a LIVE television segment on KITV News This Morning, which would air at 6:20am. 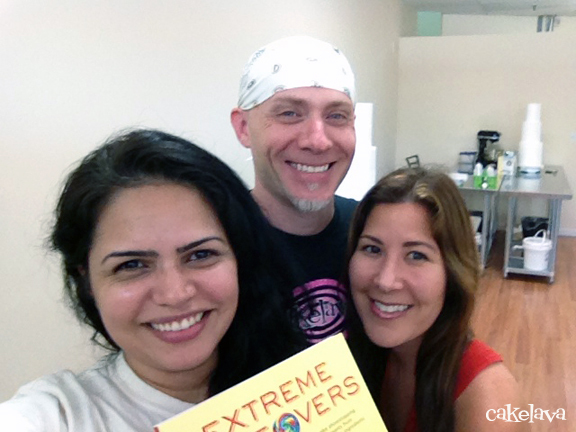 We had to be camera ready and at the studio before 6:00 and prepared to talk about our new book EXTREME CAKEOVERS. Our interview and demo went well and we had a blast doing our second TV spot this week! 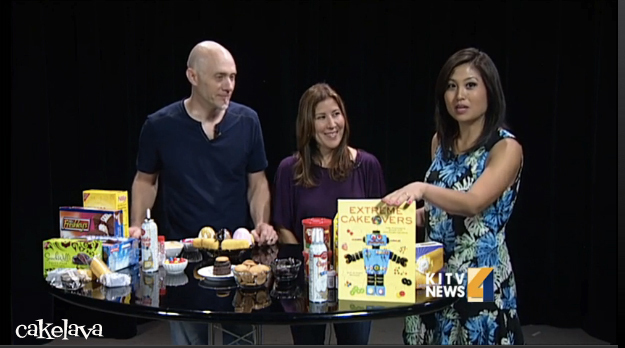 You can watch our video on KITV's website. Given our very early call time for the TV taping, we felt like we were walking around in a fog for the rest of the day. Tired, but exhilarated and pumped up from the adrenaline rush. It was not your ordinary day. We ate breakfast at 3:30am and by 10:00, we were both starved and ready for lunch. It had felt like an entire day had gone by and it was only Noon! 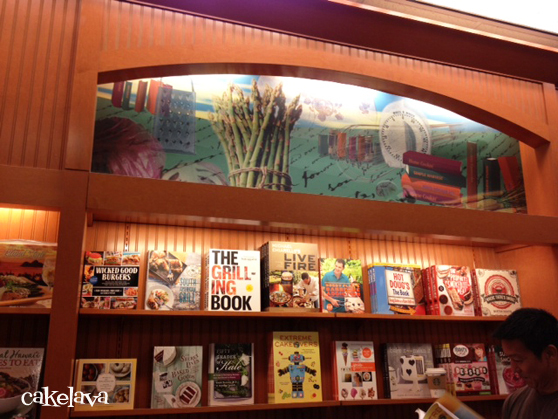 After dinner we decided to head over to the mall to Barnes & Noble, to see if our book was on the shelves. I can't begin to describe the rush of seeing your book, your baby you worked so hard on, sitting on a bookstore's shelves. A number of our friends and family have sent us photos they took of our book at their local bookstore and we've been happy to see it so prominently placed! We wanted to be able to see the book in our hometown bookstores too. 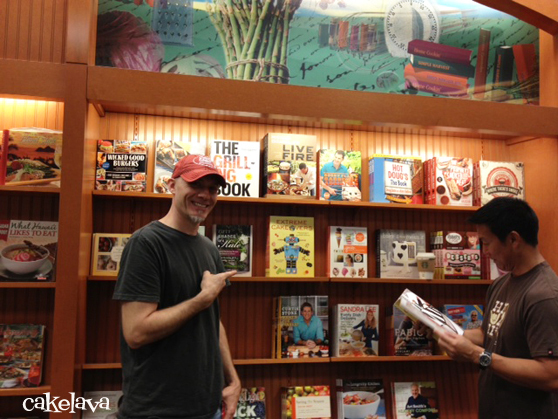 As we walked into the store and headed back to the Cookbooks section, Rick stopped in his tracks and excitedly whispered to me that someone was looking at our book! We were so excited and for a moment just stared at the back of this man's shirt wondering what part of the book he was looking at, and what he thought of it. It was a magical moment and Rick couldn't resist taking a photo of it from his mobile phone. What happened next is something neither Rick or I planned, but before I knew it, Rick approached the man and said "Cool book, huh?" and the man turned to Rick and said "Yeah, it is!" Rick and I smiled at each other. We then introduced ourselves to the man, whose name was Glenn, and told him we were the authors of the book. He looked stunned at first, like he didn't believe us. I can only imagine what it feels like to be reading a book and learn the authors are standing right next to you. It must be just as strange and wonderful as the authors noticing a stranger reading their book! Once the introductions were made, Glenn and his friend began talking with us about the book, and asked us if we would sign his copy if he bought it. "Yes, of course!" Shortly after, he walked away, book in hand to purchase it, and returned with the book and handed us a black pen he borrowed from the store. We talked a bit with the two men and Glenn asked if he could have a photo with us. We were so flattered and said "sure!" Photos were taken, everyone was happy, and we barely thought about how tired we were (or looked). Glenn left with an autographed copy of his new book and we felt fortunate to have had the experience. Having had the experience of meeting a total stranger perusing your book made our long, exciting day feel complete. If it happens again, I'm sure it will be a rush all over again, but an author can only have one "Glenn" moment, and last night was ours! Thank you to "Glenn from Guam" for being there at that very moment! 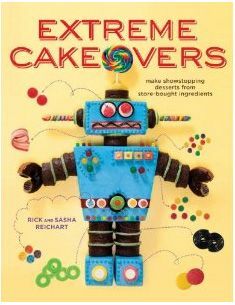 We have been anxiously awaiting Amazon.com's "Look Inside" for EXTREME CAKEOVERS for quite some time, and were excited to see it posted earlier than anticipated. The "Look Inside" feature displays a preview of the pages of the book and is often the public's first opportunity to see past the cover. We already own a precious advance copy of our book, but our family, friends, and the general public haven't seen it yet and we are thrilled to share it with everyone! 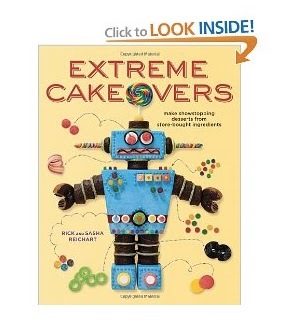 Getting to see the "Look Inside" feature for EXTREME CAKEOVERS was exhilarating! Then, we saw the book was selected by Amazon to offer Featured Recipes available to the reader for download, and our wonderful surprise tasted even sweeter! You can download our Gift Box of Pearls and Jukebox cake recipes directly from the Amazon listing. We hope you like what you see in the book and look forward to making some cakes! I was recently asking Rick if he has a cake bucket list. I was curious if he had one and what was on it. While he doesn't have a formal list written down, there are definitely designs he has his eye on and just needs the right client to request them. As I suspected, one of the designs on his cake bucket list is a hard hat diver's helmet. After last weekend, Rick can cross the diver's helmet off his list! It's hard to say who was more excited when the request for the cake came in - Rick or myself. I had been communicating with the client who was considering one of two themes for her husband Scott's 60th birthday party. Both themes had something to do the ocean and her husband's careers. We were happy to make either of them, but hopeful she would choose the diver's helmet since Rick hadn't made one before and apparently, was on his cake bucket list. If it was meant to be, it would happen. We were thrilled when she sent us an email telling us to move forward with the diver's helmet! 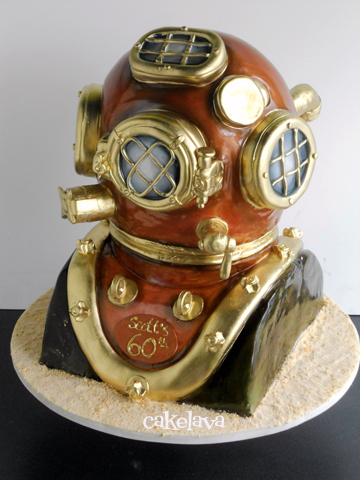 Knowing the diver's helmet would be a challenging cake, Rick allocated a good amount of time to work on it. 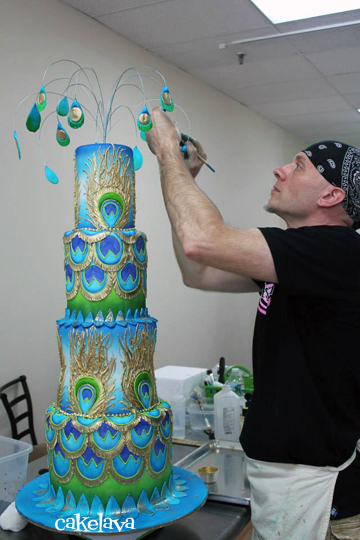 It took him 9 hours to sculpt and decorate the cake. We wanted Scott and our client to be blown away when they saw it, and make it a birthday celebration he would never forget! The party was held at our client's home. She told us that she had designed a theme based on the cake. We were very impressed at her attention to detail and how much the theme was carried out in the decor of the party. When we arrived, some guests were already there. It didn't take long for the cake to draw a crowd, which was soon followed by "THAT'S a cake?!" - music to any cake designer's ears! 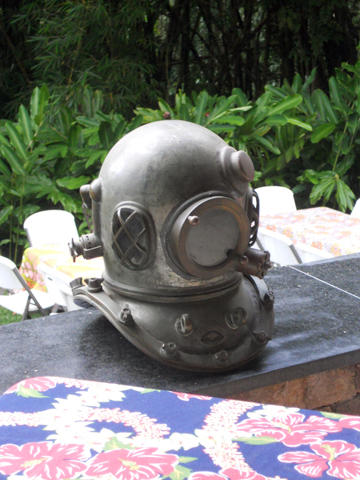 The diver's helmet cake was a huge hit, with both our client and her guests. This amazing display at the entrance to the party which included a photo of Scott, greeted guests as they arrived. 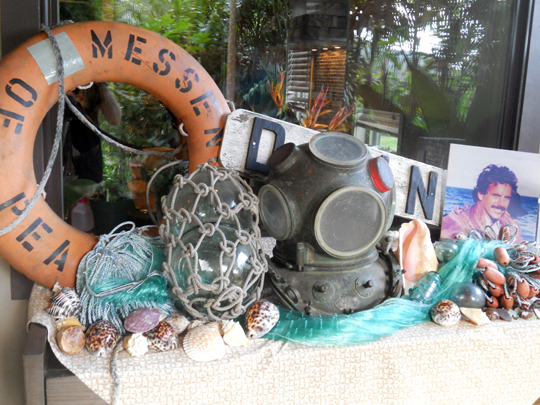 The antique diver's helmet in the display was one of many on display throughout the property. Thank you to our wonderful client for including us in Scott's very special day, and for giving us an opportunity to cross one of our new favorite cakes off the bucket list! We ended Part 2 of the 2011 retrospective of selected cakes in late June, when summer weddings in Hawaii were in full swing and we felt the added pressure of having a book to produce. Our studio was a crazy place! A portion of each day was spent working on cakelava cakes for customers and the other part was spent working on our book, and the two couldn't be more different. 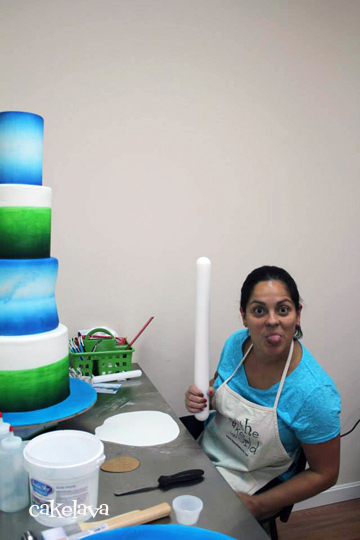 We had our custom made-from-scratch cakes where each cake was uniquely designed with a specific client in mind, and simultaneously designing cakes using all store-bought products. If we weren't making a cake, we were on a delivery, or going to a store to get products for the book. I've chosen some cakes to share from the months of July through October, starting with a very tall, dramatic hibiscus cake, shown above. 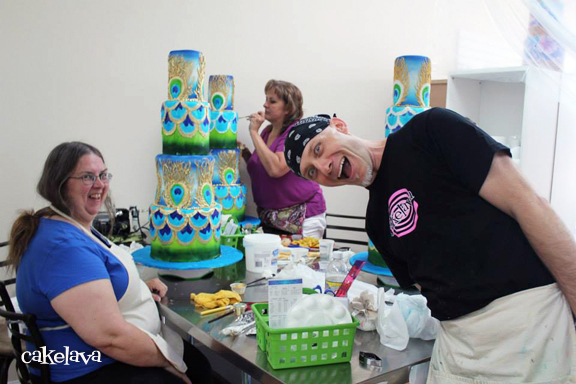 It was one of four cakes, including a fun and swirly circles design (below) Rick made for July 3rd events.